Notes: The early railway history of northern County Durham and south-east Northumberland is complex, with numerous waggonways provided from as early as the seventeenth century to convey coal from pits to navigable water for export, notably to the rivers Wear and Tyne. In County Durham the ancient port of Hartlepool was developed for coal shipment, and the Hartlepool Dock & Railway Company (HD&RC) proposed to construct a route between the port via Haswell to and Moorsley coalfield, close to the River Wear near Hetton-le-Hole and much closer to Sunderland than to Hartlepool; the HD&RC also proposed to build a branch to Durham. An Act of Parliament in 1832 gave authority for the HD&RC to build its route. The likelihood of local coal being handled at Hartlepool prompted leading figures in Sunderland including Andrew White (the first Mayor of the town), Quaker banker Edward Backhouse and Philip Laing, a shipbuilder, to promote the Durham & Sunderland Railway (D&S). This project was authorised by an Act of Parliament on 13 August 1834. The HD&RC opened its route from Hartlepool to Haswell to goods on 23 November 1835 and from 21 July 1836 contractors were permitted to operate horse-drawn passenger trains between these points. As to the Durham & Sunderland, mineral traffic was handled from 5 July 1836 and goods from 9 August; it introduced a passenger service between Sunderland (Moor, or Town Moor station) and Ryhope on 19 October 1836, extending to the HD&RC station at Haswell in April or May 1837 (where D&S trains either had to reverse to gain access or passengers changed trains to continue their journey). The D&S branch to Durham, leaving the Haswell route at Murton, opened to passengers on 28 June 1839; the terminus was actually at Shincliffe which enabled it to serve collieries conveniently, but it was over a mile from the centre of Durham city. The D&S was at first worked by stationary engines and locomotives did not displace them fully until 1855. The line’s principal challenge to locomotives was Seaton Bank, a stretch of almost 2½ miles beginning with a rising gradient of 1 in 60 at Ryhope station, increasing to 1 in 44 for over a mile through Seaton station. The D&S was purchased by the York & Newcastle Railway following an Act of 27 July 1846, and from 31 July 1854 this company (by then called the York, Newcastle & Berwick Railway) became a constituent of the North Eastern Railway (NER). As indicated above, for several months Ryhope station was temporarily the southern terminus of passenger trains, and it is most likely that the station remained in use even though it did not appear in Bradshaw until June 1858; Quick (2009) notes that the station appeared on earlier maps. The site of this station was about 11ch north of Ryhope NE (2nd) station that opened in the 1890s, and no information has been found on its structures. On 3 August 1854 the Marquis of Londonderry’s Seaham & Sunderland Railway (usually referred to as the Londonderry Railway) opened for mineral traffic. 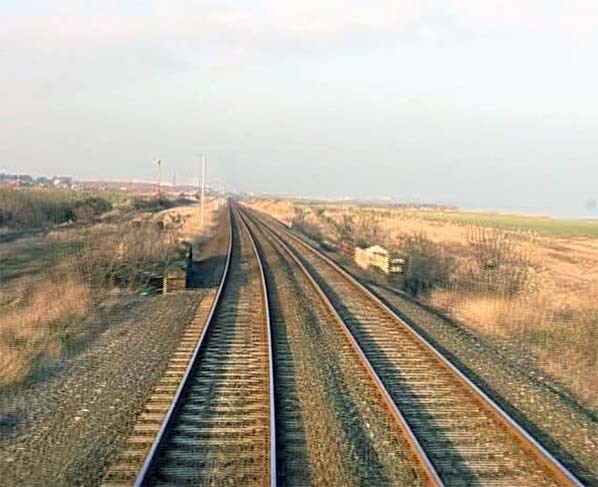 This line was approximately parallel to the northern end of the D&S (by this date, the NER) from Sunderland to Ryhope, after which it ran closer to the coast to its southern terminus at Seaham. Passenger trains were introduced on 2 July 1855 from this line’s terminus in Sunderland at Hendon Burn. There is some doubt as to whether the Londonderry Railway opened a station at Ryhope with the line on 1 July 1855, but various sources refer to one opening in 1858. The Ordnance Survey 1: 10,560 map surveyed in 1856 and the 1: 2,500 published in 1875 refer to Ryhope station (singular) at NZ414529 immediately north of the point where the NER (ex D&S) and Londonderry lines converge to run alongside each other towards Ryhope Grange Junction. Bradshaw of January 1858 says that the Londonderry Railway’s 12.55 from Seaham ‘meets the D&S trains at Ryhope’ and Quick suggests that the timing would not have allowed anything beyond a change of platforms at this point, implying that both railway companies had adjacent stations at NZ414529. Alternatively, some conveyance might have been provided between the stations / platforms, even though no mention is made of it in the timetable. The note in Bradshaw of January 1858 was absent in January 1859, by which time it seems well established that the Londonderry station at NZ414527, about 11ch south of the site shown on the 1856 / 1875 maps, was in operation. The inspection report prepared prior to the opening of the Londonderry line places Ryhope station 2 miles 20ch north of Seaham Colliery station; if it was a true interchange adjacent to the first NER station it would be closer to 2 miles 25ch. Ryhope East was 2 miles 14ch north of Seaham Colliery, the distance based on the NER line diagram. These measurements provide further uncertainty about a ‘first’ LR Ryhope station. No information has been found on the layout or buildings at the station (or stations) at NZ414529. The smaller scale of the 1856 survey precludes the representation of platforms, but it is strange that no indication of them is given on the 1875 publication at a scale on which platforms are frequently shown. NER staff records show that a Mr Rowlands was stationmaster at Ryhope, dying in service on 8 May 1879. On 5 June 1879 Mr J J Taylor was promoted from weigh clerk at Battersby to be stationmaster at Ryhope, a post he held until December 1886 when he was transferred to Tyne Dock, again as stationmaster. The timetable below shows a significant increase in the frequency of train calls at Ryhope since 1863. At this time the direct route from Sunderland to West Hartlepool via Seaham had not opened and the old D&S was the main line between Tyneside, Sunderland and the Hartlepools. On 19 August 1889 an accident occurred at Ryhope station when an express bound for Newcastle from Liverpool had descended Seaton Bank and was derailed at the sharp curve at its foot, injuring 101 passengers. As a result the NER realigned the curve. Hoole (1985) notes that a new station for Ryhope (NER) was authorised on 2 November 1893 at a cost of £1,080. Sinclair (1985) gives 1894 as the year of opening. The new station was about 100yd west of the Londonderry Railway station. This photograph from 1889 is looking east between the old and new sites of Ryhope (NER) stations and shows the breakdown train attending the site of the accident which occurred on 19 August when a Liverpool to Newcastle express was derailed on the curve at the foot of Seaton Bank. At this time Ryhope station was located about 10 chains north of this viewpoint (beyond the left edge of the photo) where the NER and Londonderry Railways converged en route to Sunderland and several years before the new NER station was opened a short distance to the right of the signal box. Two NER 398 0-6-0s can be seen on the breakdown train. 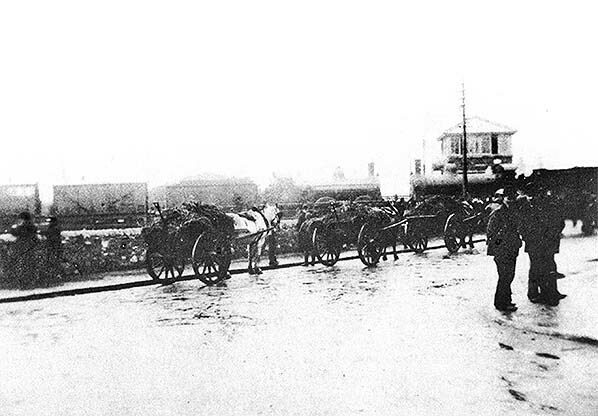 The horse-drawn carts are waiting at the level crossing in Robson Place; the crossing would soon be replaced with a bridge underneath the railway. 1861 OS 1:10,560 map. One station (‘Ryhope’) is shown a short distance north of the point where the North Eastern Railway (late Durham & Sunderland) and Londonderry (Seaham & Sunderland) come together and run parallel northwards towards their separate termini in Sunderland. This scale does not permit any detail of the station’s layout to be shown and whether there were effectively two separate stations here. In 1858 the Londonderry Railway opened a new station, on the more southerly site of Ryhope East, so the survey of this map must pre-date its opening. 1875 OS 1:2,500 map. As on the 1861 map only a single station is shown, named south of the ‘Wooden Viaduct’ over Ryhope Dene. Although platforms are usually shown at this scale, none can be seen here. A small building is shown between the western (NER) and eastern (LR) tracks – perhaps a station building – and another is west of the NER track. A new LR station opened in 1858, on the more southerly site of Ryhope East, so it appears that this OS map is simply out of date: Quick (2009) suggests that this might be the case. 1897 OS 1: 2,500 map.The first station site is no longer named and two separate Ryhope stations (see Ryhope 2nd NER and Ryhope East station pages) are drawn in detail. A building adjacent to the site of the original NER station is marked with a gated track approaching it from the south. Looking north towards the site of Ryhope first station in 2006. The station was on the north side of the bridge to Ryhope beach which is seen in this view. 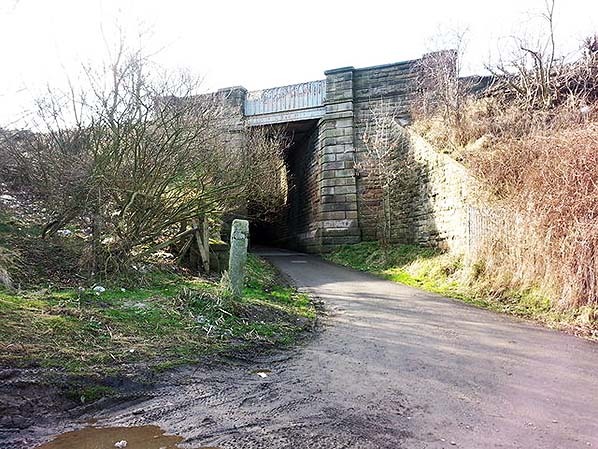 The bridge over the road to Ryhope Beach looking south-west in March 2014. The first Ryhope station was on the embankment to the north (right) of the bridge.